Project timelines always seem to put contractors on tight schedules. You know the concrete requires the time it needs to dry before the flooring can be installed, but everyone else constantly pushes to get it done faster. Nobody wants the cost of having to delay decisions because of uncertainty about when the floor can be finished. This is where moisture testing comes in. The earlier you can test and get actionable results, the earlier decisions can be made about how and when to move forward. Of course, ASTM F2170 requires a 72-hour now 24-hour equilibration period before you can conduct a documentable relative humidity (RH) test in a drilled hole. 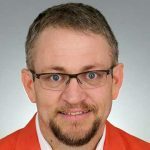 That doesn’t mean you don’t have options on how to speed up testing without sacrificing accuracy or reliability of the results. You can’t document a reading until you’ve waited 72 hours if you want to conduct an ASTM F2170-compliant RH test. That doesn’t mean you have to wait that long to get actionable data. In fact, you can cut your decision time down by up to 67 percent. That should certainly help planning and managing budget costs. Science has proven you don’t have to wait 72 hours before making a decision. The numbers look basically the same at the 24-hour mark. The reliability of the early testing results is one of the key findings of a soon-to-be-released Precision and Bias (P&B) study that was conducted by an independent laboratory under the direction of an ASTM task group. So while you can’t document RH test results until 72 hours in order to comply with ASTM F2170, you can confidently use the 24-hour reading to accelerate decision-making about the project timeline. 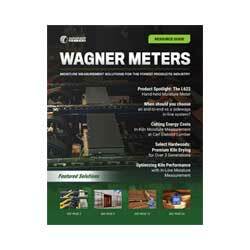 The CTLGroup partnered with Wagner Meters to develop a service temperature adjustment chart and estimator used to determine what the RH will likely be in the concrete under service conditions. It’s now making both tools available for free to contractors. If you’re using the prepared table, it assumes a water to cement (W/C) ratio of 0.5 and service condition temperature of 72° F. So just use your measured RH and temperature to find where they meet on the table. If you’re using the online calculator, you need four data points: the measured RH and temperature at the time of the test, the W/C ratio of the concrete poured, and the service condition temperature. Simply enter this information into the calculator and it provides an estimate of what the RH level will be under service conditions. Having a prediction of RH under service conditions lets you be more confident about whether the concrete will equilibrate to an acceptable moisture condition tolerance level under service conditions for the flooring you want to install. This is the RH level at which your flooring will have to adhere for the long haul and the most critical indicator whether your flooring will stick or result in failure. Using the online calculator or table enables you to safely estimate how much more drying time will be needed. Drilling the holes for the sensors inevitably leaves debris, which interferes with getting an accurate RH test reading if not properly cleaned out. Manually cleaning the hole is a bit like brushing your teeth; you think you’re doing it for long enough, but you’re probably not. We’re all in a rush to move to the next step. Fortunately, you can use a vacuum drill bit that does its own cleaning as it’s drilling. You’ll not only save time in the testing process, but it will probably clean the hole out better than you could. The quickest and easiest way to get a reading from an RH sensor is to have it delivered via Bluetooth® wireless technology to electronic storage. In order to do this, you’ll need a sensor and reader kit that’s Bluetooth® enabled. 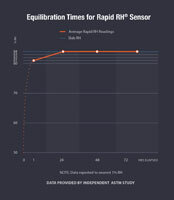 When you connect the Bluetooth®-enabled reader to the sensor, it sends the RH measurement back to whatever electronic storage, like an SD card, has been set up to receive it. In addition to the RH percentage, it should also provide the location and certification data about the sensor, all so it meets the documentation requirements of ASTM F2170. The final benefit of Bluetooth® delivery, in addition to how quick and easy it is to take a reading, is that you don’t have to worry about human error in the recording of RH levels for all the different sensors. There are a number of apps you can use to make RH testing go faster. Similar to the Bluetooth® technology, some RH test kits have a reader that can deliver test results to an app you can download onto your phone. This can make reading results easier as your phone may have a larger and brighter screen than the reader. If you’re using a reusable sensor, some RH test kit apps will capture and store the relevant calibration data for each sensor you have. You can easily see which sensors are properly calibrated for use and which need to be re-calibrated. This way, you also avoid the situation of wasting huge amounts of time trying to conduct a test with an uncalibrated sensor and have to re-test in order be in compliance with ASTM standards. While there’s no getting around the 72 hours for ASTM documentation, you don’t have to spend that time idly. Use these five tips to get the most out of that time to start making reliable decisions early in the testing process. We live in Houston, Texas. 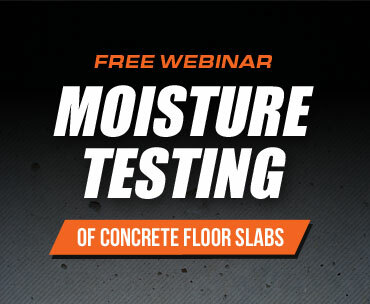 Should there be moisture between the concrete and the moisture barrier? Thanks for the question. Usually you wouldn’t expect to see this, but you give very little detail to go off of here. My guess is that you are asking this question because there is a larger problem and you are trying to identify the source. If you suspect the vapor retarder, I would recommend bringing in an engineering firm to do core sample and then give their professional opinion after a physical analysis.